Disconnect, a young San Franciscan startup, builds software than can cut off intrusive advertisers silently grabbing users' data, and protect web activity with encryption. But the average Android user won't have heard much about it. Not through Google at least, which has removed the tool from its Play store. The startup isn't backing down in its fight for people's privacy, though. Over the past year, the young firm, which boasts ex-NSA engineer Patrick Jackson as its CTO, has been wrestling Google to get its app on the marketplace so more Android users can use it to protect themselves from government snoops and digital criminals. It's losing that fight. But it won't let Google slow it down. Today, it has launched a completely refreshed app that does a lot to protect data: It encrypts communications, routes traffic through different servers across the globe, filters out more than 5,000 "invasive" services and visualises how tracking software takes information during web sessions and when running apps, allowing users to cut off digital tentacles reaching for their privates. For a VPN software with lots of bells and whistles, it's not too pricey either: the full desktop and phone application that covers up to three devices comes at $5 a month, or $50 a year. Some pieces will remain free, such as the tracking visualisation browser add-on. Disconnect has the backing of some significant voices in the security industry too. It has been installed as standard on every Blackphone—the privacy-focused smartphone based on a forked version of Android—and the "next generation" version will come with future Blackphones. Daniel Ford, chief security officer of Blackphone, told me over email there are many organizations out there that do similar work to Disconnect, but very few were actually keen to have a partnership with the secure phone maker. "Disconnect stepped up to the plate and proved that we share similar core values, and they continue to prove they are a partner. We want to work with partners not vendors," he said. Today, Disconnect will also announce another significant partnership with German ISP giant Deutsche Telekom, which will distribute a special promotion to their customers, who can try Disconnect Premium features free for one year. The company's overall mission is greater than pushing out products for privacy-minded folk, as its tussle with Google attests. CEO Casey Oppenheim believes Google doesn't want Disconnect in its store because the app shines a light on how advertisers take people's data and allows users to block them. 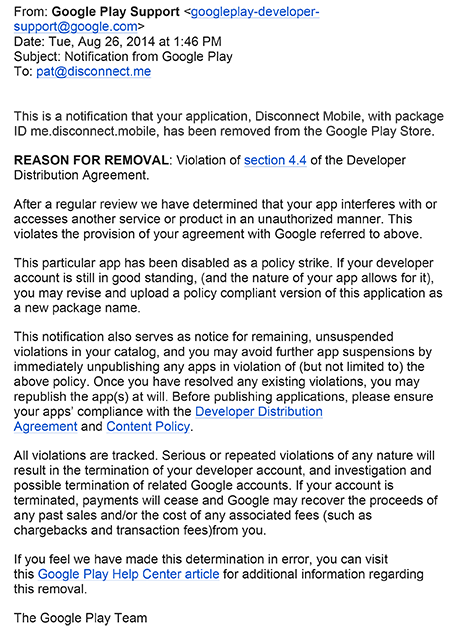 In September, things came to a head when Google sent a letter to Disconnect informing it the app would not be allowed on the Play marketplace because it broke one of the tech titan's rules: thou shalt not interfere with other apps "in an unauthorised manner." Disconnect has a good record on other platforms, including Apple's iOS. Oppenheim thinks Google is being much more cynical, glib even. Google is pulling Disconnect because it relies on advertisers, no matter how intrusive they are, to make revenue, he claimed. "Google is incredible on security except when it comes to one thing… when it comes to friction with their business model," he told me. "It's an untenable situation for consumers especially Android users where they can't protect themselves from known threats." Ironically, Disconnect was founded in 2011 by Brian Kennish, a former engineer of Google's ad publishing platform DoubleClick, along with Oppenheim. But there's evidently no love lost between the company and its alumnus. The only thing Google had to say came in a canned email statement: "We don't comment on individual apps, but will remove apps that breach our guidelines." Disconnect does want to get into the Play store again at some point, even though it's possible to tinker with Android settings to allow downloads from non-authorised developers and get the software running on a device (warning: this will increase security risks, as it opens up phones to any developer, including malicious ones). Oppenheim thinks Google will need to update its "archaic" user developer agreement before that happens. "Google has the ability to ban any app they want for any reason," Oppenheim added. The full app is available on Apple's App Store too. Why Apple and not Google? "Tim Cook has made it extremely clear, as did Steve Jobs, that privacy is absolutely paramount for their success… it's fairly clear," Oppenheim added. Given much of the tech world has growing respect for Disconnect, and Google has repeatedly upset privacy activists in recent years, especially through its alleged collusion with the NSA, the tech titan might be wise to lift its ban.